A damp start to the day, Ari has an eerie silence hanging over it, the morning mist reduces visibility as it shrouds the houses at the end of the street, making them invisible. Down below, the trees are almost hidden under a soft white blanket of fog. Water hangs in the air as church bells in the distance begin to toll. Italy on a Sunday can only be described, as ‘closed’ shops remain closed with the only doors open today belonging to the church. 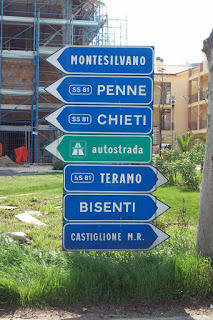 We drive into Pescara and take a nosey around the airport there, wondering how big it is. Answer: Not very. Steps explode onto the iPod attached to Pamela Pram, ‘Summer Of Love’; a cheery, cheesy tune to sing along to as we slosh our way through the lanes on the way home. We pull up outside La Baracca, a restaurant we’ve passed several times and look to see if there are any signs of life. Suddenly the door bursts open and a short guy of around 22 and dressed in a blue tracksuit shoots outside shouting, “Aperto, aperto”. I’m tempted to shout back “Calm down, calm down”, a la Harry Enfield, but think better of it as he may just be the chef. The restaurant interior is a mish mash of colours and styles, panels of artex rub shoulders with rag rolled walls and stencilling, peaches and lilacs clash with pinks and greens, it looks like an interior designers nightmare. I order a first course of gnocchi with ragu, sadly it’s not homemade but it tastes good none the less, second course is a mixed salad with arrosticini, an Abruzzo speciality of lamb skewers. Lunch is followed by coffee and although basic fare it was good food and good portion sizes too. Back home the likelihood of any sunshine brightening up the day is zero, this mood is echoed by the sound of Red Lorry, Yellow Lorry playing ‘Heaven’, the muted guitars and sombre vocals particularly suited to today’s weather. The sound of a cork being released from a bottle catches my attention and the sunshine returns in the shape of a glass of crisp white Trebbiano d’Abruzzo. A ten-minute power nap turns into a full on seventy-minute snooze, I open my eyes and am welcomed by the return of the rain, indigo skies threaten the land below and an ugly grey cloud sneers at us. I take the speakers into the kitchen and prepare dinner; Bow Wow Wow play ‘Don’t You Wanna Hold Me? Annabella Lwin’s voice cutting through the chopping of tomatoes and peppers as I sit at the kitchen table. I wonder where she is now? I remember Malcolm McLaren claimed to have discovered her singing in a dry cleaners shop in Kilburn. According to Annabella, one of McLaren’s assistants came into the shop and asked she fancied auditioning for a new band. Dinner tonight is a foccacia with a vegetable and mozzarella frittata, washed down with the remainder of the Trebbiano d’Abruzzo. Dishes are washed and put away to Billy Joel singing, ‘She’s Always A Woman’, then it’s a stroll around town to work of dinner. 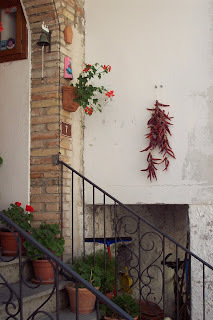 The sindaco di Ari (the mayor), Renato D’Alessandro is proud of Ari and has had hundreds of terracotta bowls filled with geraniums placed around the town. We watch swallows tending to their young safe in nests attached to the eaves of the commune office, before returning home to watch ‘Comedy Blue’ and laughing at outrageous but filthy jokes on my iTouch.